Are your hands making you look older? So often people spend time and money to ensure their face stays young and blemish free but neglect to give the same care to their hands. No one wants their glowing, wrinkle-free face that looks thirty to be betrayed by spotted, veiny hands that scream 60… (Especially when you’re 40!) Hence, we’ve gathered some handy anti-aging tips to give you glowing and youthful hands. Your hands do so much for you throughout the course of a day; the least you can do in return is nurture and protect them! Your hands are exposed to just as much sun as your face is, if not more. Overtime, the ultraviolet rays cause the skin to lose elasticity and become thin. This is why the veins on the back of your hands become more prominent as you get older. You can also develop age spots (liver spots), which are the dark patches that appear on the backside of your hands. The best way to prevent this from happening is to use a high SPF sunscreen such as our Prevention + daily ultimate protection moisturizer SPF 50. Apply it to your hands, arms (don’t forget your neck and chest) and then slip it into your bag so you can reapply throughout the day. Using sunscreen can prevent those pesky age spots, but what if you already have them? Then our Iluma intense bleaching serum is the treatment for you. The natural lightening agents will lighten the dark areas and create a more even, youthful skin tone. You can also use the Ageless total repair crème at night. Just massage it into the back of your hands before you go to bed to diminish wrinkles and firm the skin. The skin on the backside of your hands produces less oil, which is why you should apply moisturizer every time you wash them. Keeping them moisturized will prevent fine lines from forming. 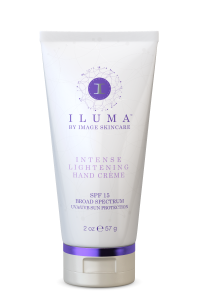 Our Iluma intense lightening hand crème SPF 15 is the perfect all-in-one treatment because it not only helps lighten dark spots, but moisturizes and protects your skin from ultraviolet rays as well. Your poor hands get plunged into hot soapy water, see a variety of cleaning chemicals and get washed several times throughout the day. They take quite the beating. Exposing your hands to harsh chemicals causes irritation, dry and cracked skin. So be sure to wear gloves when you are doing dishes or cleaning to prevent damage.